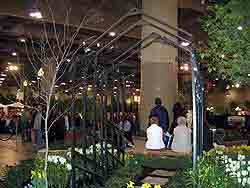 Canada Blooms: The Toronto Flower & Garden Show. 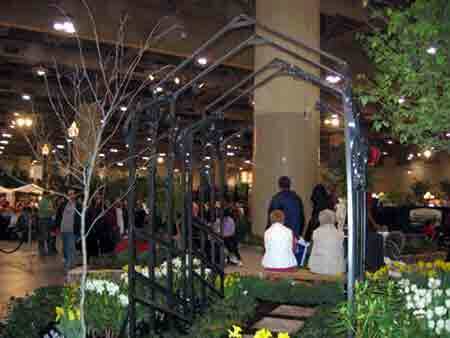 March 8-12, 2006 at the Metro Toronto Convention Centre, South Building. For several years now, I had wanted to position one of my larger decorative metalwork designs inside one of the presentation gardens at Canada Blooms. 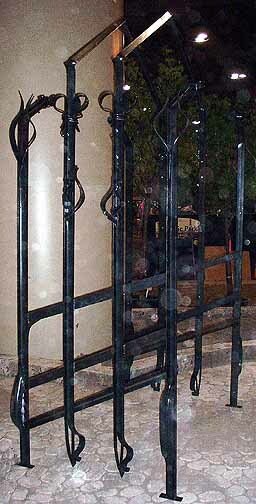 Frankly, the few metal gates or arbours that I had seen included in past years were fairly simple fabricated pieces, certainly not up to the scale or innovation that was seen in the designs of the gardens themselves. At the beginning of 2006, I had made up a portfolio disk and sent copies to a number of those landscape designers who's work I had liked. My offer was that I would create a major display piece and loan it for Canada Blooms. So I was quite pleased that the designer I most wanted to work with - Adam Gracey, replied that he was interested in the offer. The presentations by D.A Gracey and Associates had featured use of antique and weathered timbers and architectural elements overgrown with foliage. I had introduced myself to Adam when I had a booth at Canada Blooms in 2004, and had really liked his approach to designing spaces. The theme for Adam's presentation garden this year is 'A French Country Bistro'. As well as including some pieces of antique metalwork, he wanted to bracket the path from the lower entrance to an upper patio area with a free standing arbour. This was required to be quite large, with a width of five feet to ease the passage of the tens of thousands of visitors per day sure to pass through it. To keep the arbour correctly proportioned, this required the structure to be about seven feet long and roughly eight feet at the peek. 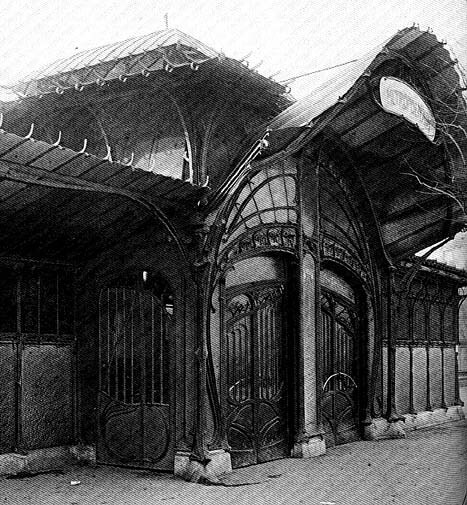 'Paris Metro' is loosely based on the work of the Art Nouveau architect Hector Guimard. 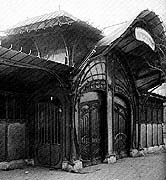 Those familiar with the period will recognize his design of stations for the Paris Metro (hence the name of the piece). 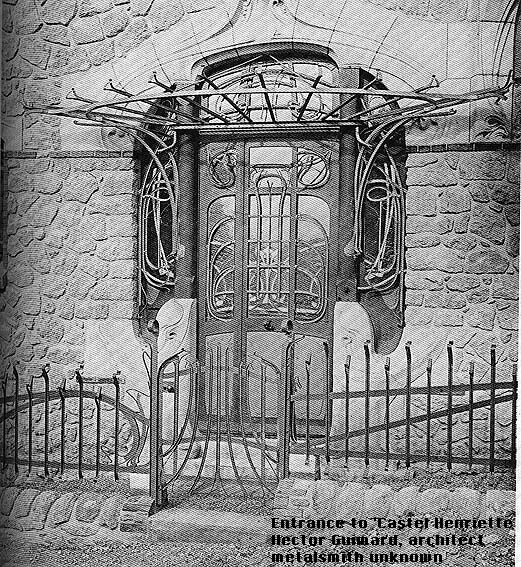 My single favourite piece of Art Nouveau metalwork is his 'Entrance to Castel Henriette"'. 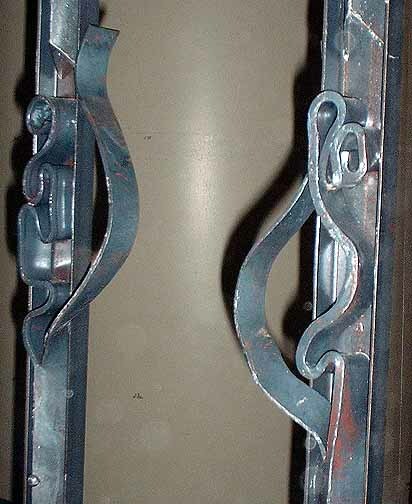 One of the features of Guimard's designs is the use of structural shapes: channel, angle and T-bar. These add physical strength to the construction, but this same strength allows for a visually lighter look to the overall work. These normally rigid lengths are forged into graceful curves - an effect only possible through the work of the smith. Further, the ends of these right angled shapes are split back into individual flat bars. These are then forged into simple curves to create dramatic terminals to uprights. The starting concept for 'Paris Metro' came from my desire to make use of structural channel and angle materials, treated in a fashion inspired by Guimard. 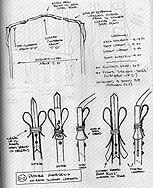 The primary materials I chose were 2 x 3 inch channel for the uprights and 1 1/2 inch angle for the decorative inserts. 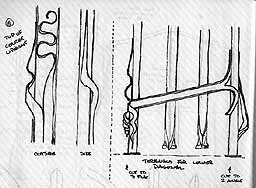 These heavier materials are not typically used for plain fabricated arbours, where light tubing is connected by variations on scrolls or simple vine work. Right at the start of the project, I decided to built the arbour using four individual rigid panels, linked in pairs via overhead arches. This effectively creates two individual modules, in this application placed close together for one continuous structure. Unusually for me, I started designing from the details towards the overall line of the individual panels. I had wanted to aggressively forge the split lines at the end of the elements. 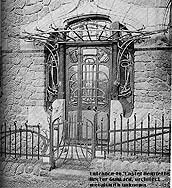 One variation inspired by the theme was the forging of the three surfaces at the ends of the channel uprights into a French 'fleur-de-lis' element. 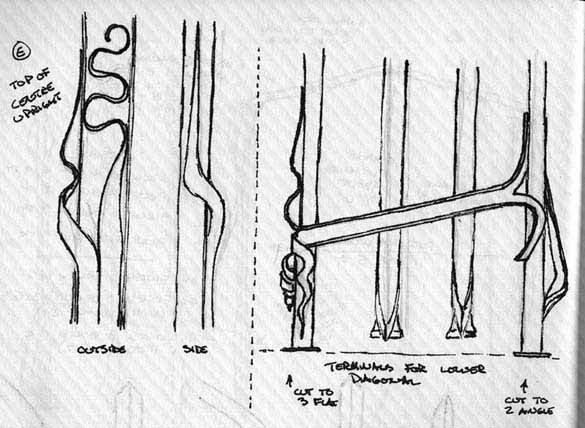 The tendril wraps serve both a structural component, helping to anchor the arches, but also echo the vegetation of the setting. 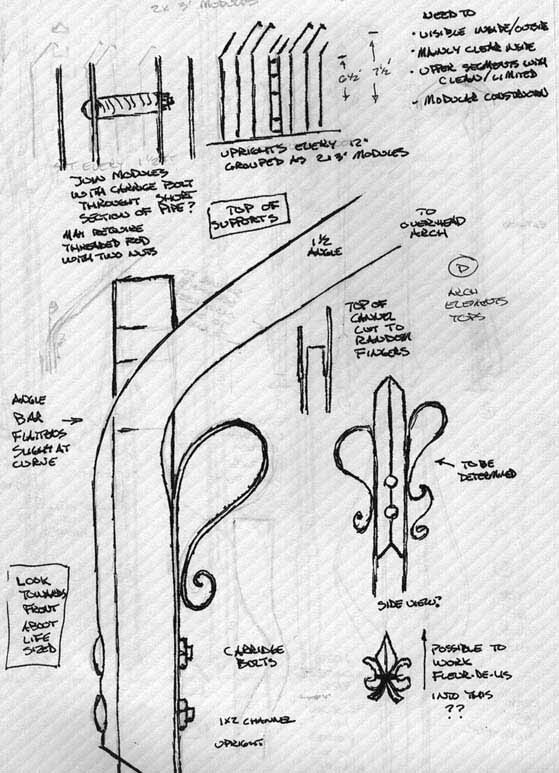 The drawings are paired with photographs of the completed arbour, taken during installation at Canada Blooms. 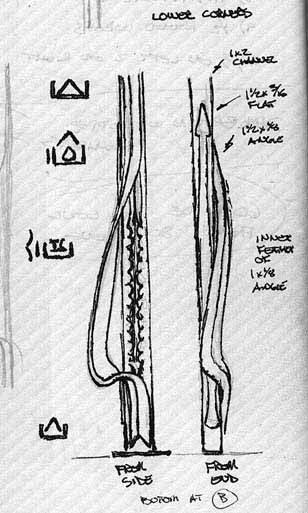 As with any art metalwork, there are variations between my original concept drawings and the final forgings. 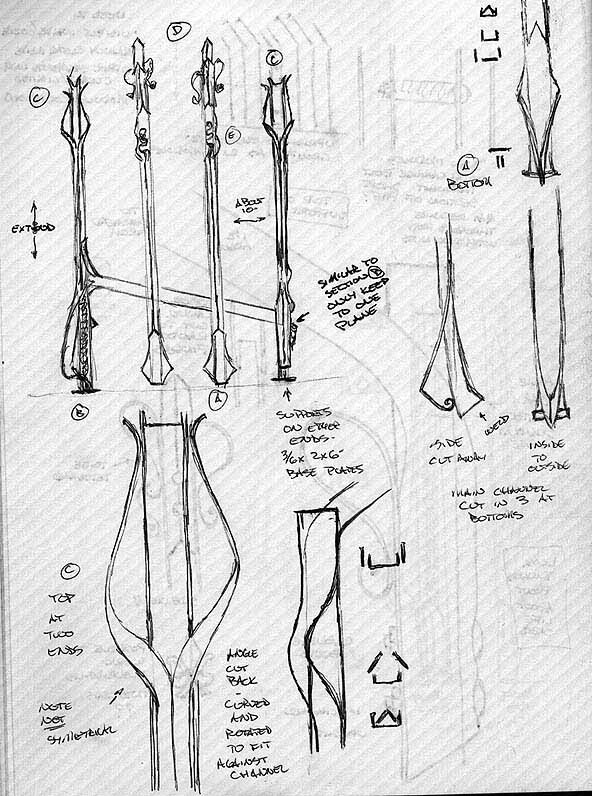 The individual drawings below (click to enlarge) are shown in the order that I conceived them. The comparison photos were taken when the arbour modules were assembled, but not installed into the display garden. 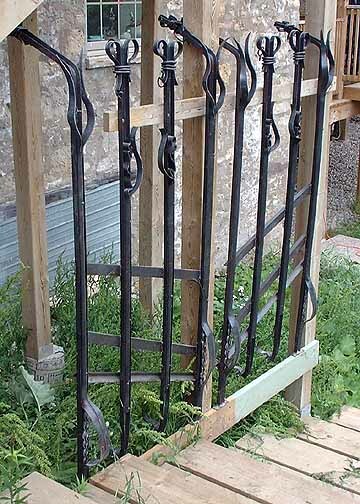 Andrew had originally suggested a distressed or rusted finish to the completed arbour. Although this piece is certainly heavy enough to allow for a natural aging and rust patina, there was simply not enough time available to allow this type of surface to develop (even with chemical acceleration). Instead I decided to leave the steel 'straight out of the forge'. This leaves a dark grey fire scale texture, with mottled colours along sections with their original industrial surface. The metal has been sealed with a semi gloss finish exterior varithane. This tends to darken these natural colours. One overall feature in the construction was the decision to us rivets to hold the decorative elements into the structural ones. 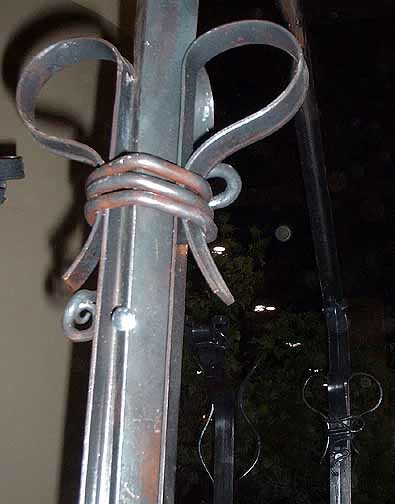 Three rivets secure each of the heavily forged angle iron pieces in place. This was done specifically so that the heads of the rivets could be removed in the future, allowing to disassemble the elements should re-painting be required (planning ahead!). One major separation from the design to the execution was with the inner beams. 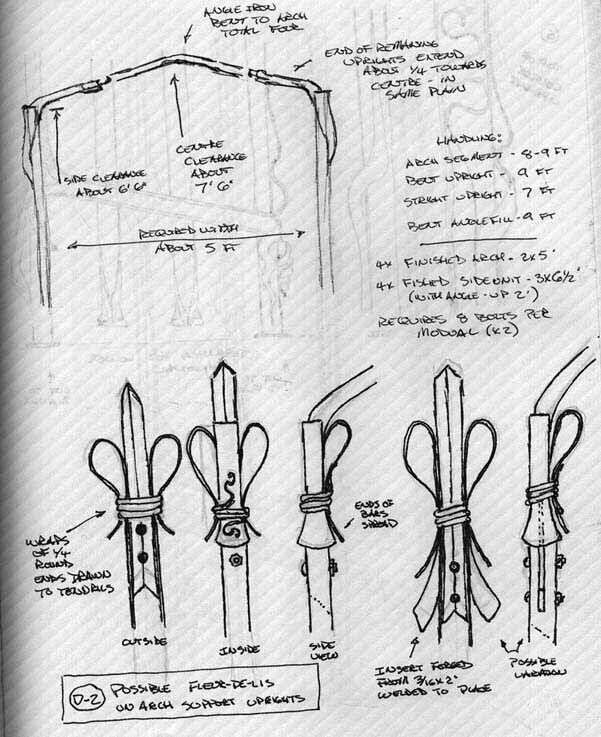 I had wanted to keep the elements that tied the separate uprights of each panel well below a persons sight line. This was to be achieved by using two lengths of the heavy channel, set on a slightly spread diagonal line from 36 to 48 inches above ground level. 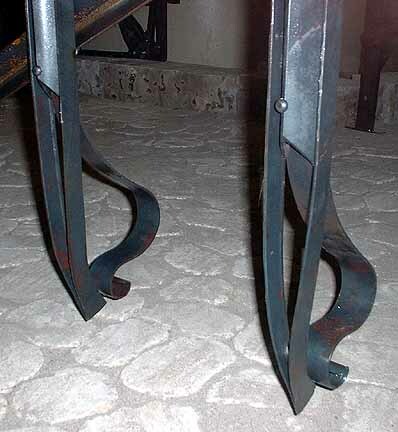 As the uprights were welded together, it became apparent that these did not provide quite enough rigidity to the overall structure. Late in the construction, I decided to add a third cross member, this one of the wide angle bar. The position of this element was largely determined by the location of the rivet heads, which could not be covered over. In the end this purely practical decision effected the overall look of these beams. There was little room now to add much by way of ornamentation in this area. Also, time was running out if the project was to be completed in time! The individual panels each weigh 'something over 100 lbs' (one * blacksmith * can lift and move them!). In total there was over 500 feet of steel required, 400 feet of that the heavier structural shapes. The cost of the raw materials alone was well over $1000. Normally a project of this scope would have required roughly four weeks to create. Time was extremely short to complete this project. The first time all the components (panels and connecting arches) had been assembled was with less than 18 hours until the actual delivery in Toronto. It became apparent that the structure needed some additional bracing. To finish the project, I will want to add a rod across the base of each of the arches. I'm thinking of using a length of 3/4 inch diameter pipe which will bolt in place on either end. 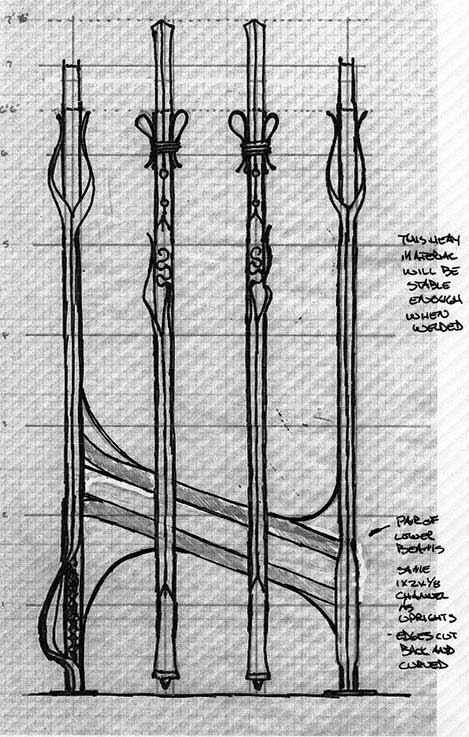 These will have some tendril work added to match those already in place on the other terminals. All other text & photographs © the Wareham Forge. .